A truly international fitness ambassador, having appeared at both consumer and trade fitness events in 36 countries resulting in being voted Best International Fitness Presenter at the 1 Body 1 World awards in New York. In addition, he recently received the Lifetime Achievement award at the International Fitness Showcase, Europe’s largest group fitness event. 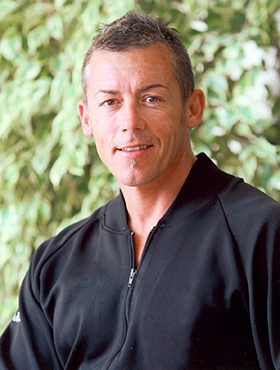 Dean has been teaching sport and fitness since 1981, is renowned for delivering a wide range of master-classes and seminars covering many themes and has accumulated a wealth of experience that reaches into several domains. He has appeared as a guest expert on a large number of television and radio programmes both in the UK and overseas and in trying to preach the fitness gospel to as wide an audience as possible he has filmed workouts on a boat in the middle of Lake Windermere, on the set of Coronation Street, on the end of Blackpool pier, in Times Square, on the roof of a Mumbai skyscraper, in a busy hotel lobby in Taipei and in an Amsterdam park with a Dutch soap opera star. Leading a mass workout in London’s Battersea Park, standing in front of the accompanying Royal Philharmonic Orchestra, is a particular highlight. Dean has created two unique products for The Great Courses that combine education and exercise to help the viewer to better understand how the body works and how physical activity can positively affect it in so many ways. He has also co-authored two fitness books and regularly writes features for mainstream newspapers and magazines with a list that includes The Times, Sunday Times, GQ, FHM, Men’s Health, Esquire, Cosmopolitan, Health & Fitness, Zest, Women’s Fitness, Slimming and Bodyfit. His unique ability to create diverse lifestyle programmes also led to him working with major brand names including Reebok, Marks & Spencer, Weight Watchers, RAC, Nike, Remington, David Lloyd, British Dental Association, 3 Mobile, Boots, Aviva and Whitbread. As a sportsman, he was 3-times World and 2-times European Karate Champion. Coaching experience includes working with basketball, soccer, tennis, golf and American football players. Dean is currently retained as a consultant by both multi-award winning spa resort Ragdale Hall and Energie Global Brand Management, the leading fitness industry franchise operator.